In the future that I’m planning on living in, nobody will carry around laptops or cell phones anymore. 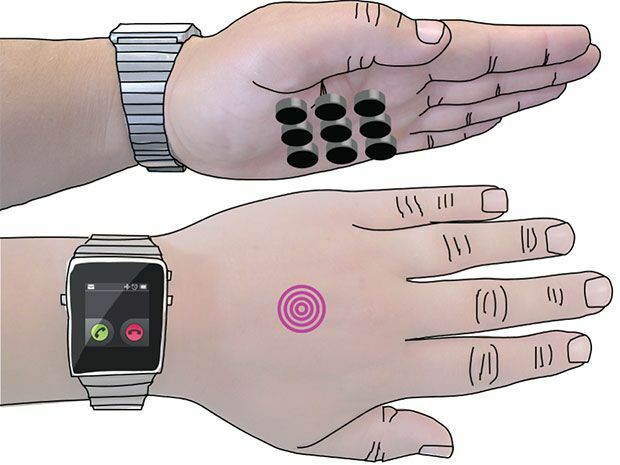 Instead, electronics will be embedded in wearables: in wristbands, in watches, in rings, in clothing, and eventually, in things like electronic temporary tattoos that you apply directly to your skin. The more embedded the technology gets, the tricker interaction with it can be, since you’re no longer physically holding objects. At the University of Sussex, in England, researchers have developed a system called SkinHaptics that transmits ultrasound straight through your body to generate focused haptic feedback on the surface of your skin. Using focused ultrasound to create tactile sensations is a very neat trick. Earlier this year, at CES, we experienced some futuristic demos from a company called Ultrahaptics. They used ultrasound emitters to create invisible, touchable interfaces in mid air. To do this, Ultrahaptics uses a grid of emitters that send out carefully timed pulses of ultrasound. By itself, each pulse isn’t powerful enough to do much, but they’re timed to constructively interfere at specific points above the emitter array. Wherever this constructive interference occurs, the ultrasound causes enough air turbulence for you to feel with your finger. The idea here is that you could wear a glove, say, with an embedded ultrasound array in the back, that could leave your palm free for some kind of touchscreen display. At the moment, ultrasonic emitters are pretty chunky, but that’s because prototypes like these rely on emitters that are designed (usually) for the automotive industry, as back-up sensors. Companies like Ultrahaptics are aggressively developing versions that are much, much smaller (millimeter-sized), and could conceivably be worked into a wearable that you might actually, you know, wear. Potentially, the same kind of technology that is already being used to make membrane speakers could make very thin and flexible ultrasonic emitters as well. The other piece of the puzzle is the sensing and display technology that will ultimately make haptic systems like SkinHaptics so useful. In addition to thin and flexible ultrasonics, we’re going to need thin and flexible touch sensors as well as thin and flexible screens. In the future (the near future, we hope), all of these elements will be melded into electronics that require no more infrastructure than your body itself. They’ll use your body as an antenna, harvest energy from you, and use you as a sensor, a display, and an interface. The upshot: We won’t have to carry electronics around ever again. Next articleVR Developers Have High Hopes for This Year—But Are They Right?